Committee Assignments - As your elected representative, I try to place myself in positions best suited to having an impact on the issues important to this community. With this in mind I continue to serve on the Senate Transportation and Finance committees as well at the K-12 Education budget subcommittee, among others. 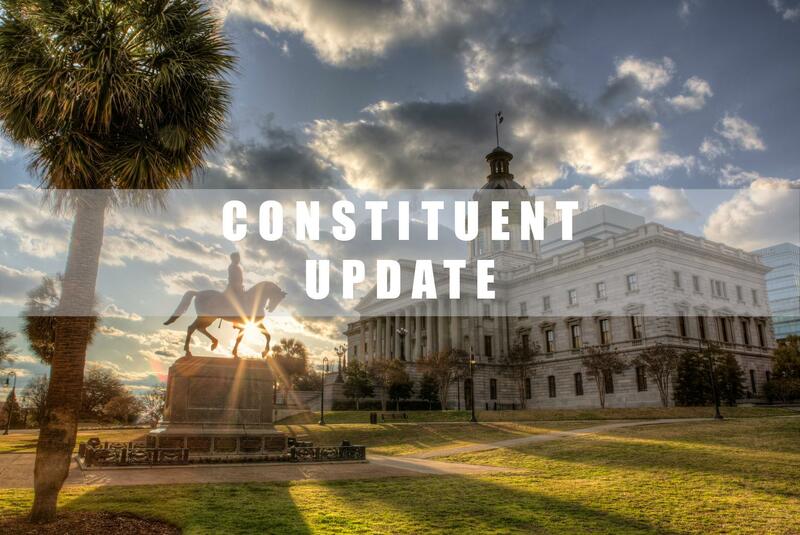 New responsibilities for the 2019 session include chairing both the Senate Ethics Committee and the newly established Senate Finance Comprehensive Taxation System Review and Reform Committee. Santee Cooper - For the past year, customers of SCE&G have had to deal with the fallout of the failure of of the VC Summer Nuclear Generating Station construction project. This $9+ billion failure consumed the lion's share of the General Assembly's time in 2018. In the end, the base load review act was repealed, rates were cut, and SCE&G and it's parent company SCANA, were acquired by Dominion Energy in a deal that mitigated, but did not eliminate, the financial burden. Lost in much of last year's efforts is that there is a second player in this construction disaster. Santee Cooper is a partial owner of the VC Summer Facility and shares in the losses. As the 2019 session begins, the General Assembly must deal with this component. A special committee has been meeting during the off season and will deliver a report soon on the viability of a sale of Santee Cooper, which is currently a state owned utility. Stay tuned. Tax Reform - The South Carolina tax system is antiquated, inefficient, and in many cases unfair. The current tax base is narrow and shrinking further. It is not built to work with the new economy. Recognizing this, policy makers have, for decades, used piecemeal changes in an attempt to rectify inequalities. While well-intentioned, this has just compounded the problem. For the first time, a senate committee has been established and charged with a full and comprehensive review of the overall tax code. We have already begun that work and have heard from local and national experts on our weaknesses and potential improvements. Education - K-12 student performance, teacher compensation, testing, school district consolidation, fiscal challenges of rural vs. high growth suburban districts, out of control college tuition, student debt, university capital projects, and workforce preparation are just a few of the education issues that will be front and center in 2019. I’ll keep you posted on these and other issues as we progress through the legislative session while being respectful of your time and your inbox clutter. As always, please reach out to me with any questions or to share your thoughts.